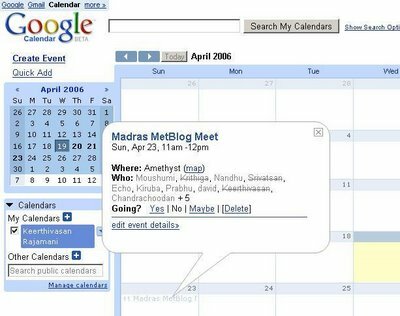 For those of you who doesnt know already, here's Google Calendar. Closely integrated with your GMail Account, it is an amazing Calendar that you will love to maintain. Cellphone Notifications , Importing Calendars, Public Calendar Search and many many more. Iam not sure how much use I can make out of it. But many Professionals can use it. 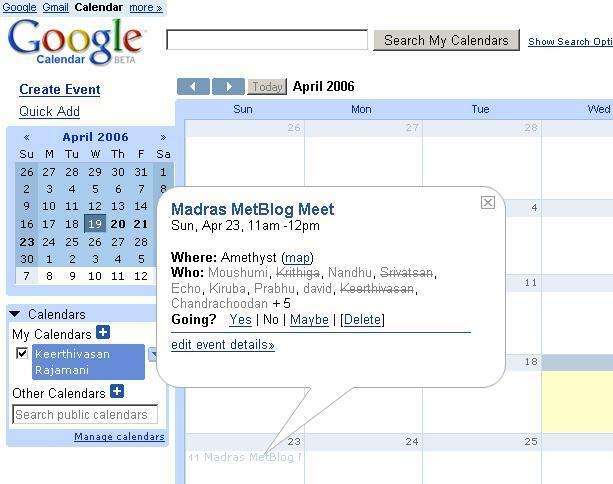 You are seeing an Event that was created for the MMM - Madras MetBlog Meet. 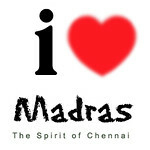 The Chennai MetroBlogging Bloggers are meeting at the Amethyst on this Sunday. Inviting people is so easy now, and their responses get updated on our Calendar (and so on theirs). Also, We can have Public Calendars, that people can search on. BTW, If you are interested to particiapte in Chennai Metroblogging please feel free to Join the meeting. Just drop in an email if you are free on Sunday. will try the google calender. Try the catalan toast at Amethyst on my behalf!